From a publication of the Portland Development Commission: “Develpoment Oriented Transit”: Development oriented transit supports improved livability for high density environments that support public goals for urban containment, sustainable living and reduced dependence on an automobile . But higher density development does not always mean a more "livable" community . In the case of development near Streetcar; however, the package includes parallel public and private efforts. Porland's Metro recommends 22,600 people around EVERY light rail station! 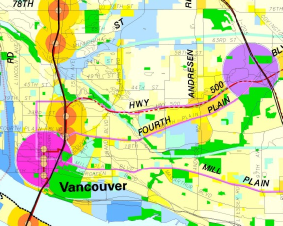 By this recommendation, Vancouver’s three initial stations would add 67,800 people to the small area near the line. To put this in perspective, that number of people would fill 204 MAX trains (332/train) At 3 minute spacing, this would take 10 hours to carry all these people to work each morning and another 10 hours in the evening. Clearly, MAX cannot do this. How will these 67,800 more people get around? Will they simply be trapped in their homes (along with you)? Do You Really Think That You Will Have A Voice In Density? They didn’t listen to the people along Burnside. They didn’t listen to the people along Interstate. Do you think they will listen to Vancouver?